SUNGSAN Corporation has been at the center of the new and used construction equipment and plant business since 1991. Now, it has gained a worldwide reputation as a supplier of reliable, flexible process equipment and plant. SUNGSAN takes pride in its reputation for servicing hundreds of repeat customers throughout the world. Based on over 20 years of experience in the construction equipment sector, SUNGSAN ensures you get equipment of high quality at reasonable prices. SUNGSAN has experienced professionals worldwide, especially in the Middle East Asia, Australia, South America, Southeast Asia, Russia, etc. With knowledge and know-how of equipment, SUNGSAN can find what you need quickly and exactly and make all the necessary arrangements to get it to you. SUNGSAN manages quality equipment, both new and used. It is specialized in CAT, Komatsu, Hitachi, Volvo, Hyundai, Doosan, Liebherr, Kobelco and other manufacturers. Also, it carries full lines of cranes, excavators, loaders, dozers, fork lifts, drilling rigs and mechanics trucks. SUNGSAN has a variety of items ready for immediate delivery, which means that you can buy used equipment and keep production moving along with your profits, rather than wait for new equipment to be manufactured. If you have surplus equipment that you would like sell, SUNGSAN is an excellent resource. Its marketing matches a client’s supply to the market demand. Also, it is a smart resource when it acts as outsourcer for corporate recovery programs. Dealing with new and used construction equipment as for construction equipment, new and used, SUNGSAN deals with the following brands: For excavators, brands like Caterpillar, Doosan, Hyundai, Volvo and Komatsu are available. And for cranes, SUNGSAN deals Tadano, Kato, Kobelco, Grove, Samsung and Liebherr. Komatsu, Caterpillar, Daewoo, Clark and Doosan are the brands that SUNGSAN has for forklifts. It also deals in loaders, dump trucks, concrete pumps, drills and spare parts. Established in 1996, Samil Heavy Industries Co., Ltd. has been specialized in manufacturing and delivering construction equipment domestically and to overseas markets. It has grown into a leading company in the field in the area, overcoming the 1997 financial crisis. Long years of accumulated steady reliability and attention from its customers make it possible for the company to continuously improve its presence and performance in the market. Samil Heavy Industries manufactures various kinds of construction equipment for concrete movement and pumping such as truck-mounted boom pump, towed-type trailer pump, placing boom for high-story operations, and mix truck for concrete movement. The pump for concrete pumping operates machinery by using oil pressure. There are three ways of operations by oil pressure to operate equipment with each advantage and disadvantage point. Most companies manufacturing concrete pumps possess technology that enables manufacturing of only one system among three operating systems, but Samil Heavy Industries obtained technologies for manufacturing all three operating systems. Thus, Samil Heavy Industries has technologies that make it possible for it to fully supply the exact system each customer wants. Samil Heavy Industries has since 2001 been exporting concrete pumps to 23 countries including those in Africa and the EU, as well as Australia, Canada, Russia, Vietnam, Brazil, etc. and provided its parts to 31 nations. Only four companies including Samil Heavy Industries among 13 domestic companies manufacturing concrete pumps in South Korea currently can manufacture boom manufacturing (boiling making for steel structure) with 100 percent own technologies. Samil Heavy Industries is the only company that has an experience of exporting technology for the related product in the domestic industry circle (GCL, India). IK International Corporation is a leading company that has its own global marketing capabilities combined with engineering service. It offers total solutions for Korean heavy equipment as customized service through its accumulated expertise in the field of construction and mining industry. In particular, it specializes in a wide range of demolition attachments to be mounted on any kind of excavator. IK provides quality products and services through close cooperation with major companies in Korea and works in close partnership with its clients all over the world for mutual satisfaction and success. Its main strengths include wide business experience with hydraulic attachments, competitive price through various supply channels and ability to provide various brands. The Skid Steer Loader is a small, rigid-frame, enginepowered machine with lift arms used to attach a wide variety of labor-saving tools or attachments. Skid Steer Loader of IK International adopts an exclusive design for convenient operational performance for the driver’s seat along with a stylish interior. When floating function is operational, it stabilizes the loader for smooth operation. In particular, the two-stage boom Skid Steer Loader BSL350EX is capable of high lifting, above the limits of general booms so it is an upgraded product that can improve difficult working conditions. Depending on the working conditions, the boom can extend freely up to 3.945mm in height and maximum 800mm. The Skid Steer Loader is used in various fields, not only limited to industrial field, but to agriculture as well. BSL330 is applied to tier-4 final as well as Euro stage 3B with Cummins engine. The impressive vertical lift path BSL330 provides powerful lifting and generous nearly any lifting of digging application. BSL330 is built for more strenuous tasks. A float function is for smoothing gravel. It is ideal for many attachments going forward so that the implement can conform to the contours of the land. S & C is a group specializing in the production of front actuators for construction equipment and has been a successful strategic partner with Doosan Infracore since 1999. It collaborated with a well-known Japanese construction machine manufacture as a partner four years ago. Among the current flagship products are its auto ripper and vibro hammer. The former reduces noise by more than 10dB against hydraulic breakers and secures performance two to five times higher covering 70% of all different types of working sites compared to hydraulic breakers. Most field works such as breaking, ripping and crushed rubble handling can be handled simultaneously. It can carry out construction work even in city zones as places sensitive to machine noise. It minimizes operators’ vibration fatigue compared to other ripper machines, so the operators’ preference for this fatigue relief can contribute to high job efficiency. Construction work in rivers and oceans is possible without extra optional devices. 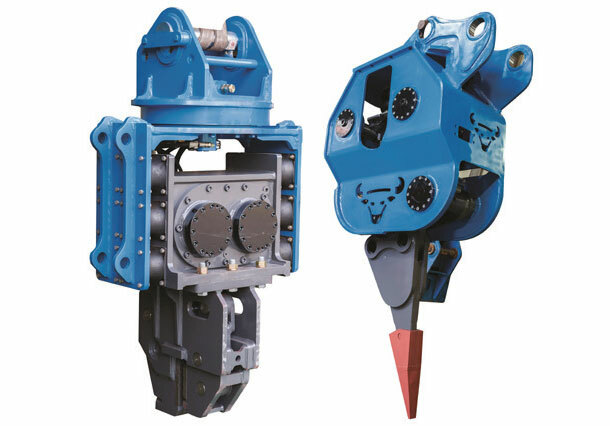 Thanks to its design, it ensures lower maintenance cost than the existing hydraulic breakers. With additional option devices, the ripper can be used as a compactor or pile-driving hammer. The latter is attractive equipment. It also gives a benefit of lower cost of maintenance than a crane hammer. With outstanding workability and mobility, it ensures easier operation in critical regions such as chaotic sections of a city, bridge areas and the vicinity of high-voltage lines than a crane hammer does. 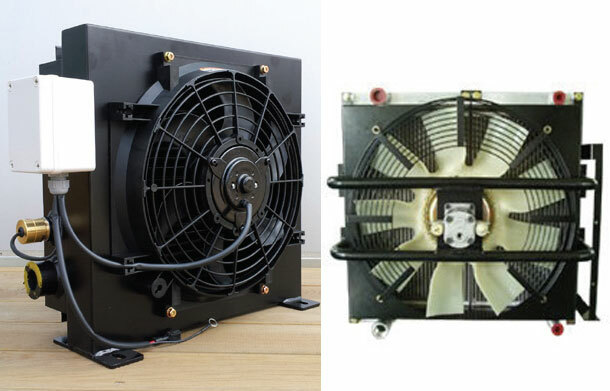 It is equipped with a high-powered hydraulic motor and suitable bearing for high frequency vibration. For high-frequency purposes, vibro isolating rubber is installed. [INQ. NO. 1505M29] S & C is a group specializing in the production of front actuators for construction equipment and has been a successful strategic partner with Doosan Infracore since 1999. It has once engaged with a well-known Japanese construction machine manufacture as collaborative partner five years ago. Among the current most flagship products are its auto ripper and vibro hammer. The former reduces noise more than 10dB against hydraulic breaker and secures performance two to five times higher covering 70% of all different types of working sites compared to hydraulic breaker. Most of field works such as breaking, ripping and crushed rubble handling can be simultaneously available. It can carry out construction work even in city zone as sensitive place to machine noise. It minimizes operator’s vibration fatigue compared to other ripper machines, so the operator’s preference for this fatigue relief can contribute to high job efficiency. Construction work in river and ocean can be available without extra optional devices. Thanks to design, it ensures lower maintenance cost than the existing hydraulic breakers. 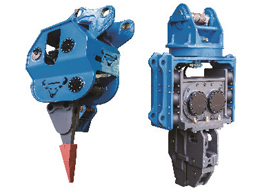 With additional option devices, the ripper can be used as compactor or pile-driving hammer. The latter is attractive equipment. It also gives a benefit of lower cost of maintenance than crane hammer. With outstanding workability and mobility, it ensures easier operation in critical regions such as chaotic sections of city, bridge areas and the vicinity of high-voltage lines than crane hammer does. It is equipped with high-powered hydraulic motor and suitable bearing for high frequency vibration. For high frequency purpose, vibro isolating rubber is installed as well. [INQ. NO. 1412M22] MSTAR processes and manufactures large CNC borings, industrial machinery, construction equipment, etc. MSTAR, based on more than 26 years of accumulated technologies and latest large facilities, constantly seeks ways to innovate itself with creative and futuristic designs and ideas in order that it will grow into a global leaders in the fields. For such vision, MSTAR promises it will make its utmost efforts, always paying close attention even to any voices of customers worldwide at the side of customers. MSTAR’s current hot items of hammers and bits are actively used for the development of groundwater, the projects of large construction, and the construction of harbors. Now MSTAR is ready for any orders in consideration of each customer’s specific business status. Filed Under: Machinery Tagged With: bits, construction equipment, Hammers, MSTAR CO. LTD.